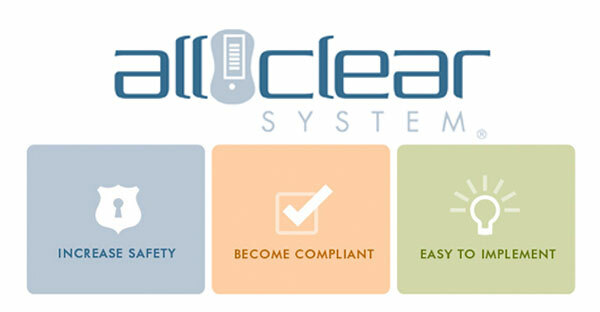 We are pleased to announce that Hamilton Safe and Security Systems has recently partnered with All Clear Systems. Our integrated solutions are the new best practice standard in regulatory compliance and employee safety. · How do your employees know that it is safe to enter a facility? · When they leave at night – do you have a system in place to help make sure they reach their cars safely? · Do you have employees that travel between branches – perhaps carrying valuables? Does someone monitor them to make sure they arrive safely? – Do you have both? – Are you using signals that are visible to everyone? – Is the window shade or the trash can an appropriate security device? · How do you prevent employees from entering a facility when an event is in process? · How are you ensuring compliance with your policies and procedures? · Provides safe / secure status to employees before entering a facility – one that is not visible to the public. · Provides for those employees leaving to ensure they have reached their car safely and if not, appropriate personnel will be notified. · Provides you with a monitor as employees travel between locations to make sure they have arrived on time. · Provides a detailed audit trail which can be used to monitor compliance with your procedures. · Available without a capital investment required. · Can be implemented easily and effectively in your facilities.